Mrs. Ify Anazonwu-Akerele is the Director-General Of Nigerian Chamber of Shipping (NCS), an apex Business Membership Organisation(BMO) in the Nigerian Maritime industry. A Sociologist and a Chartered Secretary with a Masters degree in International Relations, Ify has taken the NSC to greater heights by repositioning it to take advantage of the fast emerging opportunities in the maritime and shipping sub sector. She is a fellow and a member of numerous institutions which include: Institute of Directors(IOD); Chartered Institute of Arbitrators(MCIArb);Nigerian Institute of Management(MNIM);Advisory Board of the Maritime Arbitrators of Nigeria(MAAN);National Think Tank and National Economic Summit Group. She has been honoured with several awards but her outstanding performance is in her repositioning of NSC to be at the forefront of promoting multi-faceted development in the industry in such areas as: Promotion of local capacity,Advocacy for industry stakeholders;Maritime Arbitration,among others. 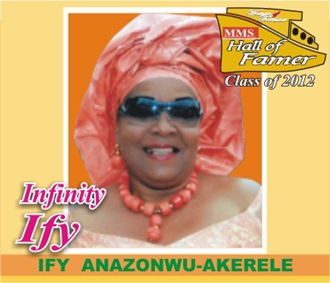 Ify is the immediate past President of WISTA-Nigeria and plays active role in making the Nigerian woman better and she is a member of 2012 class of MMS Plus’ Woman of Fortune Hall of Fame.